Do you count your ski days each season? I do (69). Some skiers find tallying ski days to be trivial, even boastful. I get the whole “quality over quantity” argument from skiers who object to the calculating your days carving snow. To the extreme, some skiers wear the best altimeter watches, vertical trackers, and log in to iPhone ski apps like Trace, Alpine Replay, North Face and Ski Tracks to obsess about their accumulated feet, never mind just days on the slopes. Why do I count my ski days? It all started when I was ski instructing at Smugglers Notch. 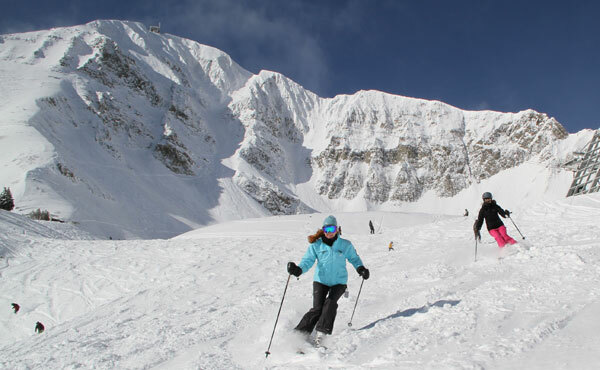 As a college student, I naively longed to be in the ultimate ski society – the PSIA. Oh to wear a ski school jacket and be the envy of all, giving ski lessons to mere pedestrians. I quickly learned my fellow Smuggs’ instructors recorded their on snow days. It was the cool thing to do, and much bravado came with breaking 100. That was bigger than bagging a private lesson or a $20 tip. Good times! Then came a real career (my previous esteem for ski instructing was revised upon review of a season’s meager wages), then marriage and children. The combination of an office job and offspring made it tough to get to the slopes. I stopped counting during the toddler days; too depressing with such small digits in ski days. 10 is not a perfect number, it’s downright wimpy for a winter of downhill. I do recall however, when I was paying big dollars for ski area daycare, those precious runs were like white gold. The meter was running, the skis were gliding, the turns were priceless (or pricey –if you’re counting). While the kids sidelined me from my favorite sport and sandbagged my ski day count for a few years, they also opened up a career in ski writing that has been a dream job for me. As a new mommy, I started writing about skiing with our kids, publishing feature articles about our family ski trips, and the rest – as they say – is history. My kids count their days now too. They also count the number of ski areas they have visited across the country (being the child of a ski writer is an even better gig than ski journalism). One trip to Idaho, they counted 5 ski areas in 7 days and 16 pillows (travel writer math: # of lodging properties multiplied by # of heads in beds). Greg counts our ski travels in quality images captured, a great day on the slopes = 100 photos to be edited down to 3-5 to be posted on our ski websites. As a ski journalist, I count my days with a different mindset than the leisure skier. Call it ski journalist math. 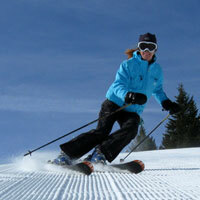 For example, 1 ski trip = 3 feature articles. Each ski season = 20 ski columns. I won’t add in the hundreds of Twitters and Facebook posts, since I am not convinced that social networking “counts”, certainly not the way a good ski day counts. Some ski days are so good you want to count them twice – like Cat Skiing at Brundage in Idaho. Skiing at Stratton at the On Snow Demo, I sampled 24 different skis, and thought that should qualify as an extra day or two. Greg said no, each day has to be legal and legit. 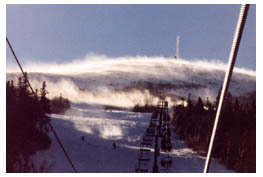 Paul Schipper skied 3,903 consecutive ski days at Sugarloaf. It took 24 years to accomplish that courageous count, dubbed “The Streak.” Schipper passed away at 85. Aren’t we glad he counted? Counting your ski days is goal setting, and achieving that sweet number (whatever you deem as your desired downhill count) is vertical victory. Besides, a big number inspires you to ski on those not-so-fair weather days. Have you ever skied in the rain and found the snow to be surprisingly good? Klaus Obermeyer, of Sport Obermeyer, had a long tradition of skiing as fast as his age. Obviously the risk increases with your respective age and speed. Count me out, 70mph at 70 sounds risky. My new goal is to ski as many days as I am old. This has been easily attainable so far, I bagged 9 days to spare this season. I wonder if I can carry forward the bonus days (like cell phone rollover minutes). That would come in handy when I am 82, and it becomes a mountainous task just to buckle my boots and lug my skis to the lift. I suppose more important than counting your ski days – is making your ski days count!